Revenue in the Men's & Boys' Apparel segment amounts to US$87,131m in 2019. The market is expected to grow annually by 1.4% (CAGR 2019-2023). In global comparison, most revenue is generated in United States (US$87,131m in 2019). In relation to total population figures, per person revenues of US$264.76 are generated in 2019. The Men’s and Boy’s Apparel market comprises all types of clothes for boys and men. Children’s clothes are not separately defined, with the exception of clothes for babies. The former are instead subsumed here under the other clothing segments. The revenue of the Men’s and Boy’s Apparel market is about half as big as the Women’s and Girl's Apparel market. Men’s Apparel is subdivided into the following segments: coats and outdoor jackets, jackets, blazers and suits, trousers, shirts and pullovers. 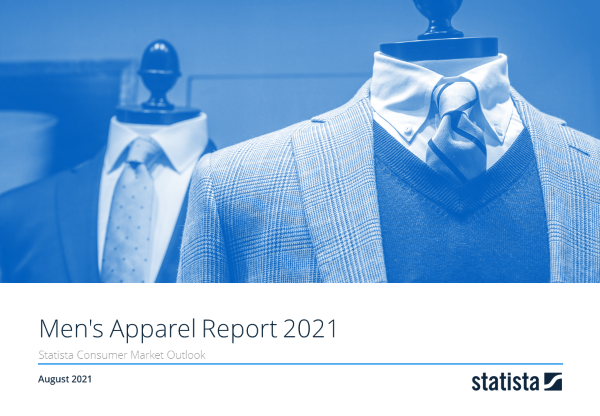 Reading Support Revenue in the Men's & Boys' Apparel segment amounts to US$87,131m in 2019. Reading Support The Men's & Boys' Apparel segment is expected to show a revenue growth of 1.4% in 2020. Reading Support The average revenue per person in the market for Men's & Boys' Apparel amounts to US$264.76 in 2019. Reading Support In the market for Men's & Boys' Apparel, volume is expected to amount to 4,378.46 m pcs. by 2023. Reading Support The market for Men's & Boys' Apparel is expected to show a volume growth of 0.7% in 2020. Reading Support The average volume per person in the market for Men's & Boys' Apparel amounts to 12.96 pieces in 2019. Reading Support The average price per unit in the market for Men's & Boys' Apparel amounts to US$20.43 in 2019. Reading Support With a market volume of US$87,131m in 2019, most revenue is generated in United States. Here you can find more studies and statistics about "Men's & Boys' Apparel".